Earn $0.89 in Rewards credit. Click to learn more. Finish Line's Dry Teflon-Plus formula is dry running so it won't attract as much dirt or grime build up as a wet lube. Works great in dry or wet weather with a long lasting mix of Teflon and synthetic oils that won't wash off too quickly in the rainy season. Perfect for on or off-road riding. Drip bottle (4 oz). I'm now using Finish Line for all my bikes. Works great. Easy to dispense from the bottle and the lubrication goes on pretty easily. Just follow the instructions and wipe off any excess. Be sure to do this in an area where you don't mind staining or place cardboard on your work area. Otherwise I like this product. And remember, a little goes a long way. I love this chain lube...dry lube is the way to go chain... stays much cleaner... less noise and after putting this lube on, my bike shifts much better! It will be a lot better if it came in a spray bottle. Its a very good lubricate don't attract dirt last along time, only if it came in a spray bottle. Been a wet lube fan for years, as previous efforts with dry lube (White Lightening) resulted in a real blobby application and a nasty film that seemed to attract road and trail grime onto the drive train, so was always cleaning the stuff off and starting over. This however is a different experience altogether. Applies easily, cleanly, and the excess is easily wiped away. After a couple of months of summer use, the drive train seems to be less dirty than either my old wet lube, or the previous attempts to lube dry. I remain skeptical that this is an all-weather lube, but will see soon enough, and if it is, I'll even convert my off-road bikes! I like a clean well lubed chain on my ultegra equipped bike since it improves the shifting performance. This lube performs well and can last for multiple 40 to 50 mile rides. I tried other lubes when my local bike shops quit carrying it but came back to Finish Line by buying on-line since the others didn't work as well. Thumbs up! I use the teflon lube because it makes cleaning easier, is less messy, and picks up less road dirt. I clean the chain frequently. Don't try to toss it in your bike carrier for airline travel - mine was confiscated by TSA! First time I have used it, applied it to road bike, hybrid, and mtb following post-winter cleaning. Smooth, no visinke residue, seems to sync very well. I rely on Finish Line Dry to keep my beach bikes operational. Use it before and after every ride. The salt and sand are brutal on all of the bike's moving parts, and FLD keeps things humming. 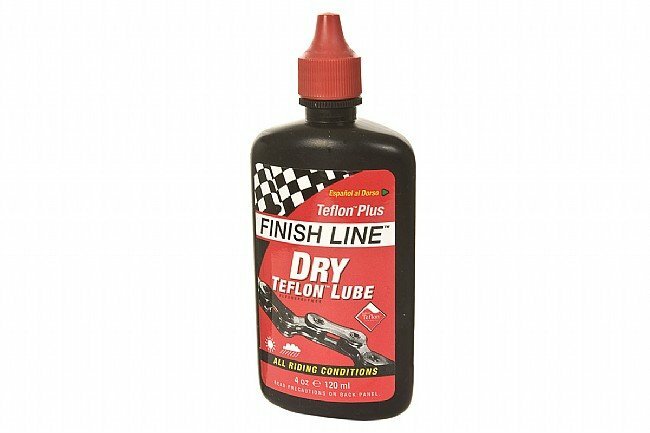 Finish Line Dry Teflon-Plus Lubricant works extremely well on bike chain. It keeps it very well lubricated for a long period. This is one of the best lubricant I have ever used. FinishLine has never let me down. A very solid petroleum-based lube. Really smooth lube that goes on easily and doesn't attract a lot of road grime. Very easy to clean. Highly recommended for dry, dusty conditions. I am using this lube during the dry summer months in the Pacific Northwest. It doesn't seem to pick up and hold to much dust and much up my drivetrain. Great product. Works as described. This is the only chain lube I use anymore, and I use it year-round. The caveat is that probably 23 of my 4000 or so miles each year are indoors, on a trainer. So, environmental conditions aren't very challenging, compared to those who ride in drydustywetmuddy conditions outside. The reason I love it for indoors is that it doesn't spatter off and throw black streaks all over my trainer or the mat beneath it, like several other chain lubes have done in the past (even after a wipe down upon every application). My chains have lasted much longer than expected, as confirmed by my handy-dandy chain tool, so I think this product does a fine job of extending chain life. First off, I probably log 80% of my 3,000-3,500 annual miles indoors on a trainer, so I'm not exposing the drivetrain to really challenging weather (other than the 95% humidity of the pain cave in a longer session). In those admittedly benign conditions, I really like this product. Many others, namely ceramic-based lubes, have produced a black liquid splatter after some use that eventually makes its way off the cassette and chain onto my trainer and the surrounding area, which is no good. This stuff works and keeps the area clean, as far as I can tell. Its great no dirt build up, runs quiet, actually seems to prolong the life of my chains. Its great I love it!! When to use grease, lubes, and solvents on bicycle parts.